There’s not another holiday that evokes as much emotion, nostalgia and raw belief as Christmas. Every adult has memories of presents under the tree in the morning, believing in Santa Claus or…the moment they found out Santa Claus wasn’t real. I didn’t have that moment of shock and horror, such as casually finding my presents hidden under my parent’s bed. I just stopped believing one year. My cousin on the other hand, gripped onto the idea of Santa Claus as if she were hanging over a dark chasm filled with hungry wolves. She refused…absolutely refused…to believe that Santa wasn’t real and we were perhaps getting a little too old to believe Santa was anything more than a metaphor. On Christmas day, we had the family get together at her house. As soon as I arrived, she would rush me upstairs to her bedroom every year to show me what “Santa” got her. This day, she proudly pointed to a new stereo set up in the corner of her bedroom, complete with two tape decks for recording and “high-speed dubbing,” an AM/FM radio, and a record player on top. Two tower speakers were on each side of it. It was 1991 and that stereo was damn awesome. “Look what Santa got me!” she proudly exclaimed, standing next to the stereo as if it was her son on the first day of school. I looked at her, shocked she had just said that. “Santa didn’t get that for you…your parents did,” I bluntly said, not caring if feelings should be hurt. She looked at me, unblinking. “No…Santa got it for me,” she said defiantly. “Santa isn’t real,” I retorted back. But she didn’t say anything more to defend herself and I decided it wasn’t worth it. If she wanted to still believe in Santa, I wasn’t going to fight her on it. The following Christmas she discovered a Barbie toothbrush in her parent’s attic space. She then received said toothbrush in her stocking from “Santa” on Christmas day. The cover was blown. Her belief in Santa went straight out the chimney he used to come down and she joined the millions of kids who have to go through the crushing realization that Santa isn’t real. As we grow up, we are told a lot of things are not real that we used to believe were just as true as the sun rising every day. As I grew up and became more and more obsessed with paranormal topics, I found myself starting to believe in the unbelievable again, or the things we are encouraged not to believe in because they cannot be proven under a microscope or in a lab somewhere. Belief in the magical and miraculous around Christmas time is a little more tolerated and even encouraged. In fact, Christmas used to be the time when ghost stories were shared. Go figure! Ghosts and Goblins at Christmas? The history of Christmas is fascinating and has its roots in ancient Pagan celebrations such as the winter solstice and yule. Because December is the darkest time of the year, our ancestors believed that was the time of the year to be scared of ghosts and goblins. It was dark and cold outside and obviously, that made it easier for the dead to return and torment the living (as if cold and darkness weren’t enough already.) The winter solstice symbolically celebrated the death of the Earth and its coming rebirth with the returning sunlight and spring season ahead. For the ancients, death was a central theme in December. It was the perfect time for ghosts and December 24 was considered the time when the veil was thinnest and the dead could easily pass from their world into ours. The English Victorian’s used to tell ghost stories around the hearth in the cold winter months and around Christmas as a way to pass the time. 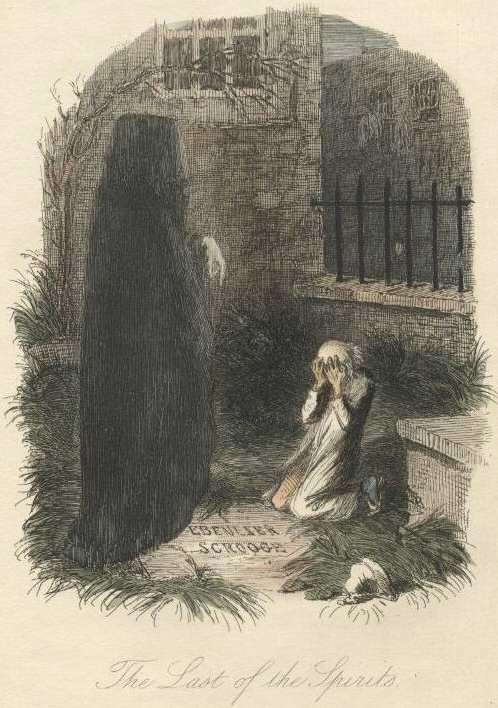 Ghost stories were immensely popular in the mid 19th century and onward. Most everyone is familiar on some level (unless you live under a rock) with Charles Dicken’s, A Christmas Carol from 1843, where Ebenezer Scrooge is visited by the ghosts of Christmas past, present, and future. We can actually thank Victorian England for many of our current holiday traditions we still celebrate such as Christmas cards. For whatever reason, telling ghost stories at Christmas became a forgotten tradition and left for the month of October. But really, what a perfect time for a ghost story…when we are actually encouraged to believe in magic and unseen forces working behind the scenes in our great, big world. Leech from the 1843 first edition of A Christmas Carol. If you are born on Christmas, you can not die by drowning or hanging. Lucky you! If you are born on Christmas, you are more prone to seeing the dead. Other versions say the dead will never bother you if born on this day. So I guess you’ll have to talk to someone born on Christmas and get their opinion on this one. Think a few evil spirits are lurking around your home? Open the doors of your house on Christmas Eve at midnight and let those wild spirits fly out into the night sky! Or the first to open the door on Christmas needs to yell “Welcome Father Christmas!” and then the bad spirits will be let out. Candles left to burn overnight in the window or windows of a house ensured good luck. If the candle is blown out in the morning…well…it’s just not good. Not good at all for you. If you deny someone a kiss under the mistletoe, bad luck is sure to find you and don’t replace the mistletoe until next year with new mistletoe, or more bad luck will find you. if they aren’t behaving for Christmas. While researching facts about the history of Christmas, I found the most awesome, Krampus. 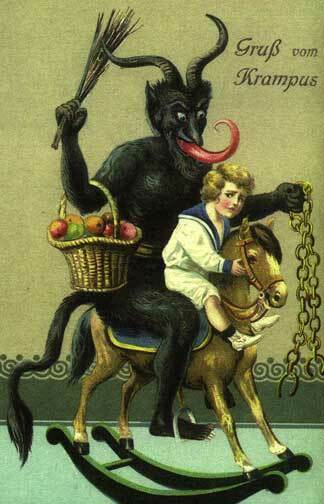 Krampus is terrifying and his main purpose is to punish bad children, while St. Nicholas rewards them. It’s a classic God/Devil, Good/Evil, Dark/Light metaphor. His popularity is mostly in European, Alpine towns. Some speculate Krampus is a pre-Christian entity and this guy is totally his own Black Metal band, complete with goat horns, black body hair, cloven hooves, a long pointed tongue and chains he whips around. It doesn’t get any more metal than that. Krampus whips his chains around, stuffs kids into bags to steal them away, eats kids if he’s hungry enough and has been known to beat bad children with birth sticks like in the old 19th-century postcard pictured above. On December 5, many towns in Europe hold Krampusnacht or “Krampus Night” parades that are pretty amazing on the costume scale. Hopefully you’ve been slightly enlightened now with some strange facts about Christmas to share with the family this holiday. Now go listen to that song by Journey “Don’t Stop Believin,” and yell the chorus over the rooftops. Because when we stop believing in things, this world becomes a pretty dull place to live in. I enjoyed reading this! I live in Krampus territory (Germany), but haven’t encountered him yet. He usually appears and Christmas markets, and I was just telling my husband we should visit a market where he’s known to visit just to try to get a Krampus sighting.